FAQ: How do I transfer my Universal database from my old computer to my new computer with EasyMatch QC? EasyMatch QC (EZMQC) allows you to import your existing Universal database. Before transferring the database in the Universal software go to Data/Status to compact the database and verify the number of records. Go to “Data/Status” to compact and count all records within each database. The Universal data import function in EZMQC assumes that Universal software is installed at C:\Universe on the same computer as EasyMatch QC. If Universal software is not installed on the same computer as EasyMatch QC, copy the entire file folder at C:\Universe to a large flash disk, CD or Drop Box account for transfer and paste it onto the new computer on the C drive. The Universal file folder on the new computer should be located at C:\Universe. In the Universal software, make sure that the database you wish to transfer is set as your default database. The default database path can be identified in the top status bar of Universal software. The database will be ‘Example’ in this case. You can select the active database in Universal Software by going to “File/Open Data Base”, and the database name will show in the banner bar at the top of the screen. Once you have installed EZMQC on the new computer open the program. You will notice at the top of the program the Database is indicated. For a new installation of EZMQC this will be EZQC. To import the Universal database into EZMQC, go to “File/Database/Universal Database Import”. A new window will open to populate the records from the Universal database. From this window you can either select individual records (can select multiple by using Ctrl) or you can use the ‘Select All’ button. Once you have selected the desired records click the ‘Import Database’ button. If you wish to import a different Universal database, use the ‘Set Database Folder’ button on the right hand side of this window to select your next Universal database to import. 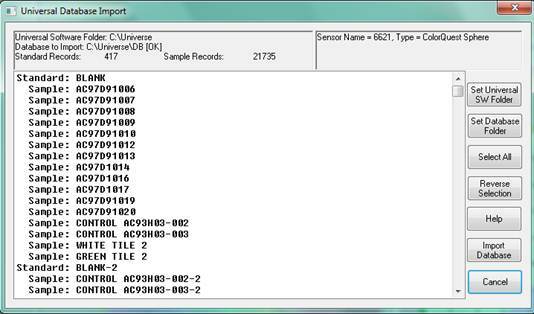 This window also indicates the number of Standard and Sample records as well as the sensor type and serial number associated with the database. You will be prompted to choose where the imported data will be stored. You can import to a database, import to the currently opened job, or import to a new job. Typically if you have bee working with a database in Universal software, you would import to a database in EZMQC. Once you make a selection, EasyMatch QC will import records to the selected destination. If you are importing a large database this could take several minutes. Once the import is complete, EasyMatch QC will confirm the import, and give you the opportunity to view the import report. If you have imported the Universal database to a EasyMatch QC database (not a Job), you can recall any Standard or Sample by going to ‘File/Recall from Database’. This is recommended to make sure that all records were transferred successfully. A window will open that allows you to recall either a standard or sample with various parameters.